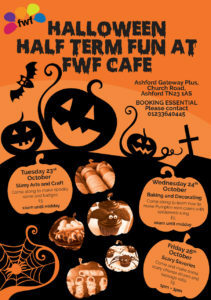 Once again the ‘A’ team at the cafe are hosting some creative and spooky fun sessions making some weird and wonderful Halloween creations. If you fancy coming along and for Slimy Arts and Crafts on Tuesday 23rd, Baking and Decorating cakes on Wednesday 24th and Scary Savouries on Friday 26th. Full details on how to book can be found below.